During an employment interview, the interviewer meets with potential employees to evaluate their skills, capabilities, and levels of experience. When, as a prospective employee, you find yourself sitting in the hot seat, keep in mind that while there are no standard responses, your replies should be clear and relevant. Stopping in silence to gather your thoughts is not only helpful but wise. Listen carefully. If you feel the question is unclear, ask politely for clarification. Pause before answering to consider all facts that may substantiate your response. Always offer positive information; avoid negativity at all times. Get directly to the point. Ask if listener would like you to go into great detail before you do. Discuss only the facts needed to respond to the question. Focus and re-focus attention on your successes. Remember, the goal is not to have the right answers so much as it is to convince the interviewer that you are the right person. Be truthful, but try not to offer unsolicited information. Try not to open yourself to areas of questioning that could pose difficulties for you. Every confident job hunter would like to think that "winging it" during an interview is the best policy, perhaps the most natural. 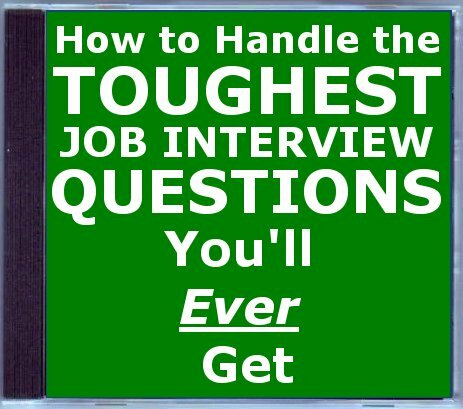 However, we recommend that you do take some time to think through your answers to some common interview questions. Taking that time to formulate your answers and solidify your thoughts will give you more poise and security during the actual interview. If you could have your choice of any job, what would it be and why? Why do you want to go into this field? What are your short- and long-range goals and how do you expect to achieve them? What does success mean to you? How do you measure it? Do you plan to further your education? If so, to what extent? What have you done to improve yourself during the past year? If you could relive the last 15 years, what changes would you make? Tell me about your greatest achievement and greatest disappointment? Tell me about the best and worst bosses you've ever had. How do you handle your reaction when you don't get what you want? Give me a couple of examples. How do you pull a team together when it seems to be going nowhere? What qualities do you prize the most in those that report directly to you? What type of people do you have the most trouble getting along with in the workplace, and, how do you handle it? What constructive criticism have you received from employers? Everybody has pet peeves. What are yours? What else do you think I should know about you? When did you leave your last job and why? At your last job, how much of the work did you perform independently? What are some of the problems you have encountered in your past jobs? How did you solve the problems? At your last job, how much was performed by a team? What prevented you from advancing in your former positions? What have you been doing since you left your last job? What do you expect to experience in this job that you did not experience in your past jobs? How do you feel about evening work? Weekend work? Carrying a pager? Being on call? Assuming we make you an offer, what do you see as your future here? How does this job compare with them? If you feel you have any weaknesses with regard to this job, what would they be? What is your leadership style? Please give examples of this style in a real situation. What could you contribute to our facility? What weaknesses in your work habits do you think you need most to work on? Why do you believe that you are the best candidate for this job? Why are you applying for a position for which you are obviously overqualified? Why are you applying for a position for which you are obviously underqualified? Why do you believe that you could handle this position? Since you are overqualified for this position, what do you hope to gain from it? You don't have the necessary experience or background for this position, so why would my organization benefit from having you in this role? How soon would you be able to start this position if we offer it to you? What salary range are you wishing to be considered for? you r doing a fantastic job. it,s really a good collection of questions. Q1	Tell me about yourself. Q2	What are your greatest strengths? Q3	What are your greatest weaknesses? Q4	Tell me about something you did – or failed to do – that you now feel a little ashamed of. Q5	Why are you leaving (or did you leave) this position? Q7	Why should I hire you? Q8	Aren’t you overqualified for this position? Q9	Where do you see yourself five years from now? Q10	Describe your ideal company, location and job. Q11	Why do you want to work at our company? Q12	What are your career options right now? Q13	Why have you been out of work so long? Q15	What good books have you read lately? Q16	Tell me about a situation when your work was criticized. Q17	What are your outside interest? Q19	How do you feel about reporting to a younger person (minority, woman, etc)? Q21	Would you lie for the company? Q22	Looking back, what would you do differently in your life? Q23	Could you have done better in your last job? Q24	Can you work under pressure? Q25	What makes you angry? Q26	Why aren’t you earning more money at this stage of your career? Q27	Who has inspired you in your life and why? Q28	What was the toughest decision you ever had to make? Q29	Tell me about the most boring job you’ve ever had. Q30	Have you been absent from work more than a few days in any previous position? Q31	What changes would you make if you came on board? Q33	How do you feel about working nights and weekends? Q34	Are you willing to relocate or travel? Q35	Do you have the stomach to fire people? Have you had experience firing many people? Q36	Why have you had so many jobs? Q37	What do you see as the proper role/mission of… …a good (job title you’re seeking); …a good manager; …an executive in serving the community; …a leading company in our industry; etc. Q38	What would you say to your boss if he’s crazy about an idea, but you think it stinks? Q39	How could you have improved your career progress? Q40	What would you do if a fellow executive on your own corporate level wasn’t pulling his/her weight…and this was hurting your department? Q41	You’ve been with your firm a long time. Won’t it be hard switching to a new company? Q42	May I contact your present employer for a reference? Q44	Where could you use some improvement? Q45	What do you worry about? Q46	How many hours a week do you normally work? Q47	What’s the most difficult part of being a (job title)? Q49	What was the toughest challenge you’ve ever faced? Q50	Have you consider starting your own business? Q51	What are your goals? Q52	What do you for when you hire people? Q53	Sell me this stapler…(this pencil…this clock…or some other object on interviewer’s desk). Q54	“The Salary Question” – How much money do you want? Q57	What was the toughest part of your last job? Q58	How do you define success…and how do you measure up to your own definition?. Q59	“The Opinion Question” – What do you think about …Abortion…The President…The Death Penalty…(or any other controversial subject)? Q60	If you won $10 million lottery, would you still work? Q61	Looking back on your last position, have you done your best work? Q62	Why should I hire you from the outside when I could promote someone from within? Q64	On a scale of one to ten, rate me as an interviewer.